A few weeks back, I posted my standard tuna pasta salad recipe with peas and dill. Well, summer is just the time for pasta salads, I guess, because on the 4th I made another one for lunch, but it wasn’t the same old salad. You see, I have a precious stockpile of oil-packed Italian tuna in the pantry that I refuse to use on your typical mayo-based tuna salad. It just seems wrong; I keep water-packed albacore on hand for that sort of thing, but we had run out after a lunch of tuna melts a week or two ago. So although Jeremy was requesting more tuna melts, I started rummaging through the kitchen for some alternate ideas. Let’s see: besides the good tuna, I had whole wheat rotini, a container of crumbled feta, some already-chopped sweet onion, a handful of baby spinach with a looming expiration date, and a big mug of asparagus ever so slowly shriveling away from neglect (caused by asparagus overload). My brain wandered to a salad recipe I had seen in this month’s Cooking Light, asparagus ribbons with goat cheese and tomato in a lemony dressing. 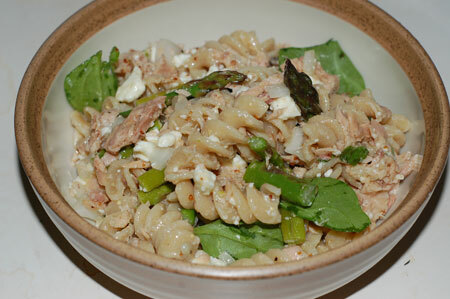 Although my asparagus was in no condition for being ribbonized, I could slice it and blanch it, tossing it together with the pasta, feta, veggies and tuna for a lightly dressed lemony pasta salad. So that’s what I did. And it was darn good, too. Tuna melts…pah! All the amounts in this recipe are estimated, because I just made it up on the fly, tasting as I went and making adjustments. If anything, I would have liked more lemony flavor, and if I’d had a fresh lemon to juice, I would also have added some fresh zest to the dressing. Boil a large pot full of salted water and add pasta; cook according to package directions, about 13 minutes. Meanwhile, slice asparagus into 1″ pieces and make vinaigrette: Whisk together lemon juice, mustard, salt, lemon peel and sugar, and whisk in olive oil in a slow stream until emulsified. When pasta is 2-3 minutes from being done, add asparagus to pasta water. Drain when pasta is al dente and asparagus is tender-crisp, and run under cold water to bring down to about room temperature. Transfer to a large salad or mixing bowl, and immediately stir in spinach and onion. Add tuna, feta, and dressing; taste, and adjust seasoning. Serve at room temperature or chilled.